Sony has finally updated the design lines of its smartphones and abandoned the now more than ubiquitous Omnibalance style for cooler and more attractive lines. Displays are finally giving up parts of the side frames by adopting an 18:9 format, but that might not be enough in a world dominated by bezel-less devices with notches. We thoroughly tested the Sony Xperia XZ2 display, one of the last devices that proudly features an LCD panel. On its new flagship for 2018, the company has installed a 5.7-inch display with an 18:9 format and 76% screen-to-body ratio. Longer displays are becoming customary in the smartphone market and it would’ve been a big mistake to ignore this trend. The panel has FullHD+ resolution, i.e. 1080x2160 pixels, and a density of 424 ppi. It's strange to see how Sony rounded and curved the Xperia XZ2, but still decided to keep the classic corners on the display at the expense of the current trend. Sony has also stayed the course with its panel technology. There’s no OLED (which they probably can’t produce at a competitive quality) on this Xperia XZ2, which once again utilizes an IPS Triluminous LCD screen equipped with an X-Reality Engine. The panel supports 24-bit color depth and is HDR certified. You’re not only able to watch HDR video content on YouTube, but you can also enjoy HDR on videos recorded by your smartphone in 4K HDR 10 bit (if the function is enabled), which is a big deal. The smartphone also has a conversion engine that can transform non-HDR content into HDR. Thanks to these capabilities, video content on your smartphone will certainly be more enjoyable, and you’ll notice slight improvements, but don’t expect miracles. After all, your smartphone can’t invent the information you need if a video wasn’t recorded in HDR. In our measurements we found that the display is particularly bright, even if it’s not at the level of the displays on the iPhone X or Galaxy S9, which reaches almost 620 nits in white. Although it’s not the brightest display on the market, you’ll have absolutely no problem viewing content, even in direct sunlight. If you compare it to other LCDs, the black is very good with a measured brightness of 0.456 nits. But the contrasts won’t be absolute like they are on OLED panels. The contrast we measured was 1356:1 under normal conditions, but it can increase considerably when viewing HDR content. Professional Mode: less saturated colors and 100% sRGB range covered. Standard Mode: Widest color range of the Triluminos display. Super-vivid Mode: an extra saturated color profile for strong stomachs. What’s going on at Sony? 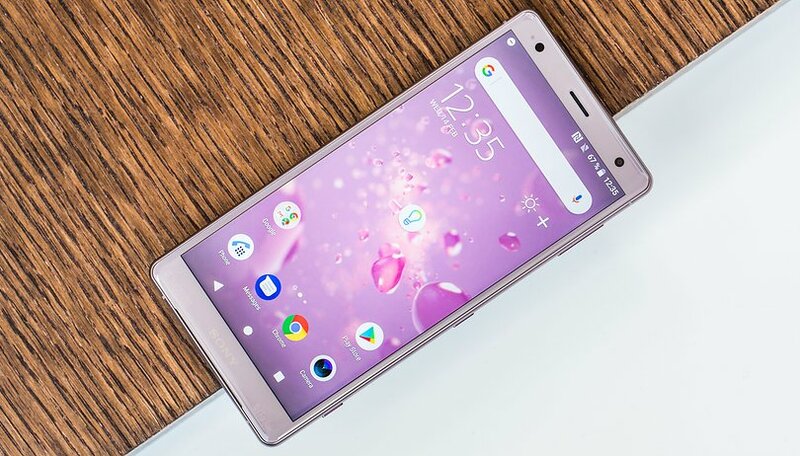 The use of an LCD panel also leads us to another unpleasant surprise: the Sony Xperia XZ2 doesn’t have Always on display, just the Ambient display. When you receive a notification or lift your smartphone from the table, you’re able to see the time and notifications in white on a black background for a few seconds. You can’t even double-tap to wake up the smartphone. What do you think about the display on the Sony Xperia XZ2? Are you a fan of Sony Triluminos technology or do you prefer the OLEDs that the competition offer? Alot of phone enthusiast forget that the people these companies are targeting don't know a thing about specs or features. Amoled only displays blacks better! It can't even display a perfect white no matter what u do at least on Samsung Galaxies. The only amoled which has good colour calibration is the iPhone X. For me, amoled displays burn my eyes. So lcd for me. i do think it should be pointed out another stupid move by sony. their devices tend to cost almost flagship prices but they are bringing nothing to the table. without OIS or OLED, pricing is not justified. i only had my XZ1C for a week and realized the mistake i had made. are you guys getting paid by Samsung or any other company. this is just like a way to make people hate sony. the oled thing its on the way.no company except the I phone doesn't provide an oled. then always on display it consumes to much battery sony didn't opt it so it became the most battery efficient phone. doing such performance in a led is a great thing. rpunded corner it is acceseble via app in playstore, if it was rounded it cannot be made square for those who love square so they put it square. Did Samsung or Apple pay you guys for this article?.... I mean.... literally what the hell is the point of this article? Other than as a smear? The average person cannot tell the difference between a high quality LCD screen and an OLED one. And I would argue that the average person also doesn't care. OLED is rather overhyped and most screens across the board of a variety of products are still LCD because of cost, lack of competion in the production of OLED, and the fact that high quality LCD screens are pretty damn good.... especially when using a good image processor as Sony does (Sony does make the best image processors in the world). The image processor is as important as the screen. But of course that's not the point of a smear piece like this.... is it? Sony just cant get things right after so many years. Customers want OLED, they stick to LCD, customers want slim bezel (no notch), they stick to thick bazel, even xz2 got slim down but its still thick.. customer want bigger battery, they stick to small one (lower of 3000). Just if they make all these right then they sure can triple their sales..
Whats wrong with the battery then? Its one of the most efficient phones on the market right now and many people get up to 2 days of usage. I'd like to stick on to Sony LCD.. They are more natural and don't burn in... Sony is not a copy cat... (center home button like Samsung... Copying the iPhone, notch... Being copied by the Chinese) "Like no other, it's a Sony"